Security staff and workers in healthcare settings are at a higher risk than the typical workplace: in the U.S., the rate of assaults on health care workers is 400% higher than it is for private sector workers. Security officers perform a range of day-to-day duties that bring them in contact with especially vulnerable patients and highly distressed individuals – an environment with high incidence of volatility. The potential for violence in a hospital setting was the subject of a study that found 154 hospitals in the US experienced a shooting event with a victim, resulting in 235 victims, in a 12-year period. In April 2015, OSHA issued new guidelines to help healthcare and social service workers better protect themselves from workplace violence. According to OSHA there were between 23,540 and 25,630 workplace assaults annually between 2011 and 2013, with between 70 and 74 percent of those assaults occurring in healthcare and social service settings. According to the Bureau of Labor Statistics, 27 out of every 100 fatalities in the healthcare and social service fields in 2013 were due to assaults or violent acts. 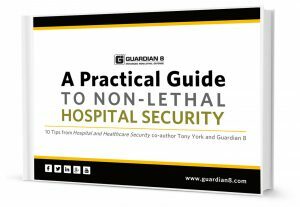 Even workers in hospitals express concern about how they could respond to an incident of violence as well as the need for a non-lethal response to mitigate the potential risk to everyone involved. In a survey by Campus Safety, How Safe Is Your Campus?, 40 percent of hospital respondents believe they would not be able to respond effectively if an active shooter or bomber came onto their campuses. And, 44 percent say they don’t have enough and the right type of lethal and less lethal weapons. Security officers have traditionally been equipped as “armed” or “unarmed” without an intermediate choice for defense and deterrence. The Pro V2 fills this intermediate need for an effective non-lethal response. An incident response plan is the most important factor in the extensive preparation needed to provide a comprehensive security program for a healthcare facility. Adding an intermediate, non-lethal response with layered defense into the program gives security officers a number of important advantages. As part of an incident response plan, the Pro V2 can be used by any staff member in any setting at a substantially lower risk and lower cost than lethal force. Safe, legal and non-lethal in every situation, even risk-averse workplaces. Improves the overall effectiveness of security programs with an Intermediate defensive solution that doesn’t carry the liability or higher cost of armed security. Guards can temper their response appropriately and end a confrontation while minimizing risk to themselves or others. Creates a flexible buffer zone so guards can most reasonably respond to the situation at hand. Eliminates distraction of reaching for phone or two-way radio and establishes communication with command center. 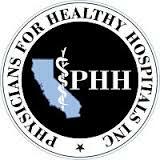 Protects not only guards but also the health care community where they work. Brian J. Fulton – Manager, Public Safetuy, Day Kimball Healthcare, Conn.
Robert Pavlik, Director of Security, Physicians for Healthy Hospitals, Calif.